Calum Semple, a Professor in Child Health and Outbreak Medicine, is providing support to a local public health campaign to ensure everyone gets to breathe the cleanest air possible. The ‘Let’s Clear the Air Liverpool’ campaign, run by Liverpool City Council and partners, outlines the steps people can take to mitigate the impact of air pollution in Liverpool and highlights the stark health consequences of pollution caused mainly by cars and also industry. The aim is to encourage changes in behaviour by making small changes to significantly reduce the amount of pollution and improve the quality of the air in the city. In a video produced for the campaign Professor Semple explains how children are more likely to have wheeze or asthma if they’re exposed to air pollution. 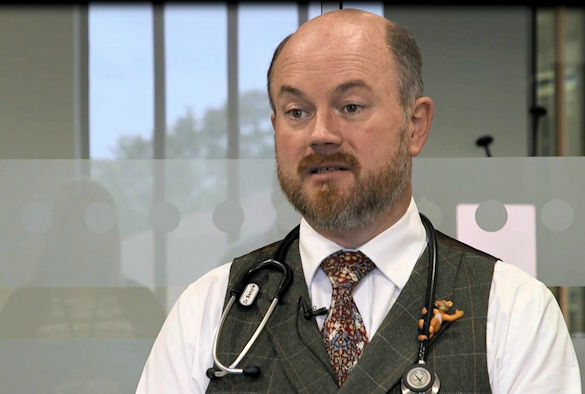 Professor Semple, who is also a Consultant in Paediatric Respiratory Medicine at Alder Hey Children’s Hospital, said: “We are seeing parents bring their children into our clinics and they themselves are recognising the closeness they live to these busy roads is causing problems for the child’s health. “Children are more likely to get severe bronchitis and pneumonia and that makes them come into hospital. There is quite a lot of evidence to show the presence of small particles from car fumes is associated with increasing the risk of these problems and increasing the severity of these problems for children. “We think the reason children are suffering more is because they are shorter, they’re closer to the ground, children actually breathe a little bit faster than adults do, so they breathe in more of the fumes. There’s another problem that children have, they’re growing, their lungs are still developing and any insult to a developing lung will result in that lung not developing as it should do. World Immunisation Week: Have you been vaccinated? Research led by @LivUni has played a key role in the development and introduction of the rotavirus vaccine. An evaluation of the impact of rotavirus vaccine in Malawi showed that it reduced infant deaths by nearly a third.